Although most of the children’s medicines that we can find in the pharmacy contain different active ingredients of chemical origin, it is also possible to acquire medicines of more natural origin. This is the case of Prospantus, a medicine whose effect is obtained from the dry extract of hedera hélix.L (ivy), a medicinal plant with mucolytic and expectorant qualities. What is Prospantus? What is it for? Prospantus is a medicine with mucolytic and expectorant qualities, which means that it is a syrup especially indicated for the temporary treatment of a cough that usually accompanies benign bronchial affections. In addition, as with another mucolytic syrup of recognized popularity as is the case of Mucosan Pediatric, it also facilitates the elimination of mucus. In this case, Prospantus has another even more interesting medicinal quality, which is that it is able to modify a dry cough in a productive cough, making it also less frequent. Prospantus, therefore, is part of the group of drugs known as mucolytics and expectorants. This therapeutic quality is obtained thanks to the fact that it contains dry extract of the hedera hélix.L plant, a medicinal plant belonging to the family of the Araliaceae and popularly known as ivy, which has traditionally been used in case of affections of the device. respiratory, especially in case of colds, cough, excess mucus, asthma, rhinitis or pulmonary emphysema. So, when is it appropriate to give Prospantus to the child? Being a medicine with mucolytic and expectorant action, it is a natural medicinal syrup suitable when the child has a cough with expectoration, especially if this is a dry and irritative cough, to be able to return to a productive cough. In addition, it is useful when you also have mucus, helping to facilitate the elimination of mucus. 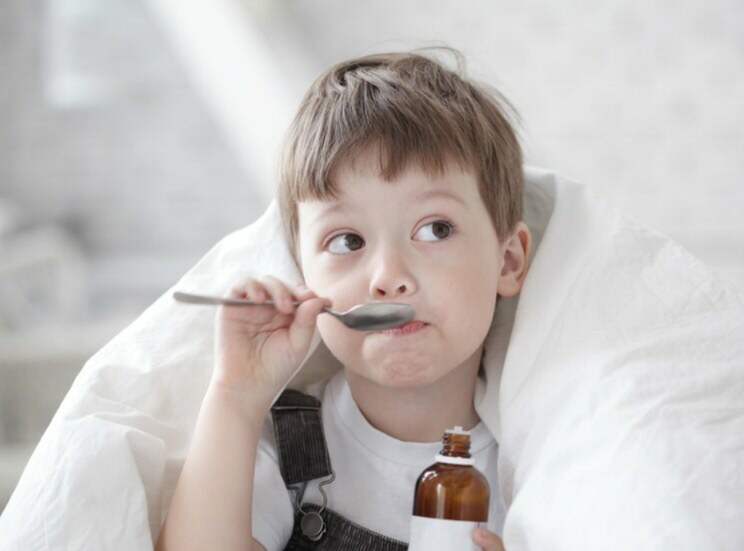 Although it is a syrup known precisely for being a child medicine of recognized effectiveness in the treatment of a cough and mucus, the truth is that not only can children (as of 2 years of age). Its consumption is also suitable for teenagers and adults. Therefore, it can be taken at any age from 2 years of age. Of course, if a cough is persistent or recurrent in children aged 2 to 4 years it is advisable to go to the pediatrician for an adequate medical diagnosis, especially before starting treatment. It is not suitable or recommended for children under 2 years, as it can aggravate respiratory symptoms. Children between 2 and 6 years old: 2.5 ml of syrup. 2 times a day (morning and night). Children between 6 and 12 years old: 5 ml of syrup. 2 times a day (morning and night). Children over 12 years: 5 ml. of syrup. 3 times a day (morning, midday and night). Adolescents and Adults: 5 ml. of syrup. 3 times a day (morning, midday and night). And how to keep Prospantus? No special storage conditions are required, it is not necessary to keep it for example in the fridge. Of course, it must be kept out of sight and reach of children, and take into account that the syrup expires after 6 months once opened. As with most medications, Prospantus can produce some adverse effects. Among the most frequent, we find ourselves, especially with diarrhea, nausea or vomiting. While, among the rare, can cause allergic reactions such as hives, rashes, and dyspnea (difficulty breathing).